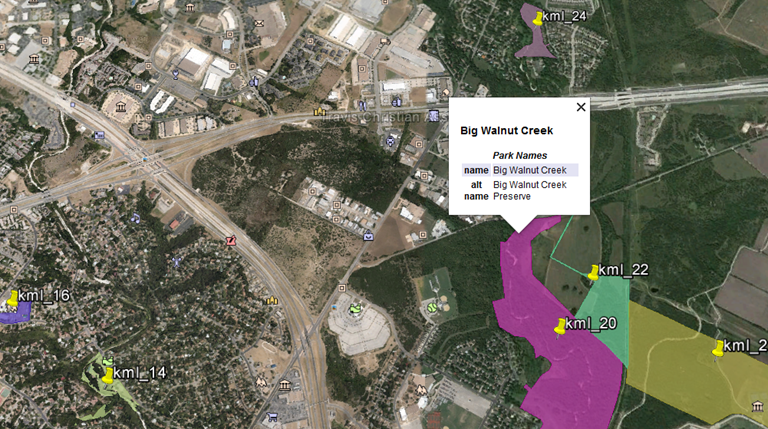 See how to create KML data and style it. We'll look at attributes, regionation (display scales), coordinate systems, balloons, and other styling, This demo converts MapInfo .TAB to KML. Writing a basic KML dataset, without complex node types or feature styling, is easy with FME. FME will attempt to preserve any source styling when writing KML output. The following example could be applied to other formats than MapInfo TAB. 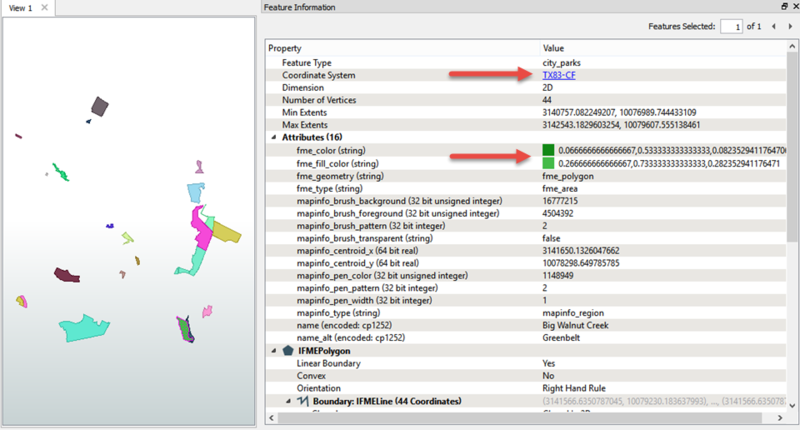 Source MapInfo TAB data, "city_parks.tab", is read using the MapInfo TAB (MITAB) reader. The data is tagged with the coordinate system TX83-CF. The KMLRegionSetter is used to create regions that set Level of Detail bounds within KML. For polygons, the KMLRegionSetter is used to calculate the Region Bounding Box from the Feature Bounding Box, and maximum and minimum display sizes are set. For points, a Region Bounding Box, as well as maximum and minimum display sizes are set using the KMLRegionSetter. Point features produce an infinitely small bounding box and would never show in the output. Therefore, it is better to set a bounding box for point features. Open the data in Google Earth, to view KML styling and balloons. The park polygons have the same colors as in the source data. This is due to FME preserving the source styling attributes, fme_color and fme_fill_color attributes. Zoom in and out to notice the effect of the Minimum and Maximum Display sizes.